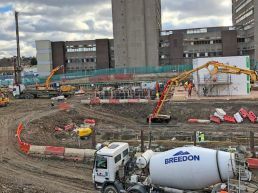 Central Piling has played an important role in helping one of the UK’s leading housing companies regenerate a former industrial site for much-needed housing and amenities. The Hyde in north London is a landmark development of 387 homes (including 139 shared ownership and 34 affordable rent) and 647m2 of community facilities and commercial space. 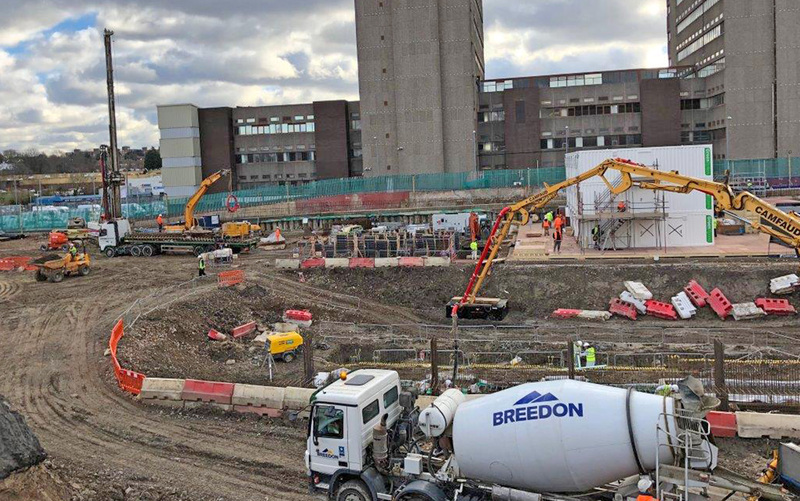 The mixed tenure development is being built by L&Q on a 3.6 acre (1.5ha) site in Hendon formerly occupied by a Homebase retail store and a used car sales lot. The new family homes are organised in 11 blocks ranging from six to 14 storeys, all sitting on a large basement containing car and cycle parking. 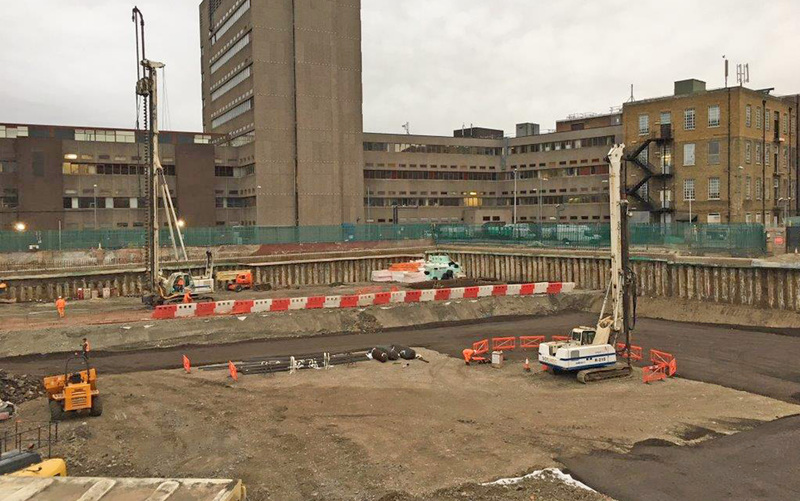 Central Piling has installed the contiguous piled wall that forms this basement, as well as all the piles required to support the tower structures themselves. A tight construction schedule meant that piling was carried out alongside other site activities, requiring high levels of planning and coordination. 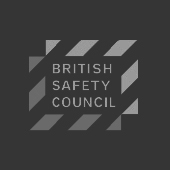 Before piling began, contaminated soil left over from the site’s previous use was removed, and an Unexploded Objects (UXO) survey was carried out, as the site was known to be in the proximity of where bombs were dropped during the wars. The ground itself consists of 5m of made ground, a 4m layer of soft to firm slightly sandy clay and then 8.7m of London Clay and 7.8m of Lower Mottled Beds – a stiff to very stiff clay. 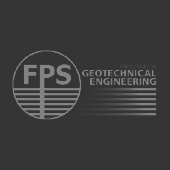 Central Piling carried out the pile design, with the main constraint being to provide the most cost-efficient solution within the parameters set by the scope of works. The piles were designed to embed into the London Clay and Lower Mottled Beds as competent bearing strata. 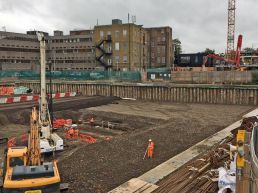 The piling work was carried out in two visits, with Central Piling initially working on the first two blocks of apartments, known as Blocks A and B. 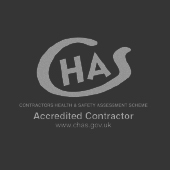 The company arrived on site in February 2017, and spent three months installing a tower crane base, five test piles and 316 bearing piles for the building foundations, with a total value of around £375,000. Preliminary and working piles loads tests were undertaken on the test piles to confirm and validate the design assumptions. The crane base was formed of nine piles, all 600mm in diameter and up to 25m in depth, while the test piles and 316 bearing piles were 400mm in diameter. 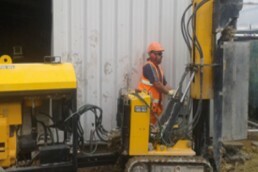 Central Piling chose continuous flight (CFA) piling for depths up to 25m and diameters up to 600mm, because it is a fast and reliable method of pile installation with reduced impact on the environment in terms of noise and vibration. 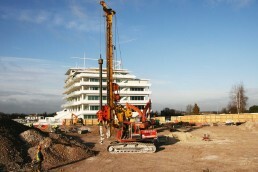 The CFA piles were installed using a Soilmec SF-50 CFA drilling rig. 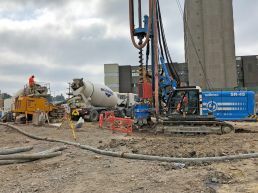 The company also used a smaller lorry-mounted Soilmec R-210 rotary rig where the ground was dry and the piles could stay open while they were being drilled. 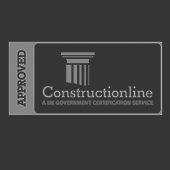 Central Piling’s second visit to the site was from May 2017 to June 2018. 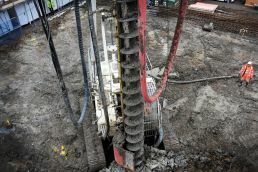 During this period, the company carried out £1.6 million of piling work for the remainder of the residential blocks, known as Blocks C to L. This included the basement wall, made up of 432 contiguous piles, all 600mm in diameter and reaching depths of up to 25m. The company also installed a further three cranes bases, each made up of nine piles at 600mm in diameter, as well as 13 test piles and 1,445 bearing piles at 400mm in diameter. Again, the company used a combination of the SF-50 CFA rig and the R-210 rotary rig. 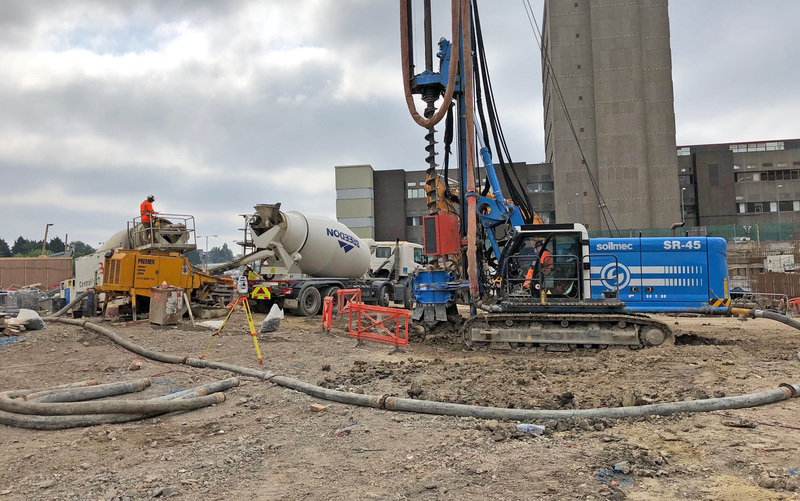 Central Piling also had another three Soilmec machines on site: an SR-45, an SR-65 and the larger SR-75 hydraulic drilling rig, which was used to install 13 piles at 900mm in diameter. 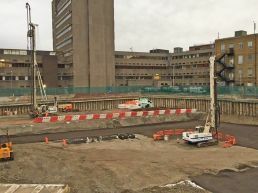 The main challenges for the piling company came during the second visit, when Central Piling had five rigs on site, all working in different areas at the same time as groundworkers were starting on the main excavation and basement construction. 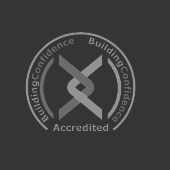 Although The Hyde is a very large site, the interfaces between the different trades had to be planned and managed very carefully, with key contractors meeting weekly to discuss logistics and plan their activities. Work areas were segregated, and delivery slots were booked in advance to avoid clashes. 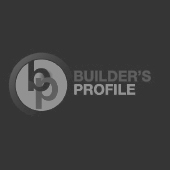 Close collaboration between all parties ensured that the piling contract went smoothly, and construction of the residential towers went ahead as planned, enabling residents to move into the first two blocks in September 2018. 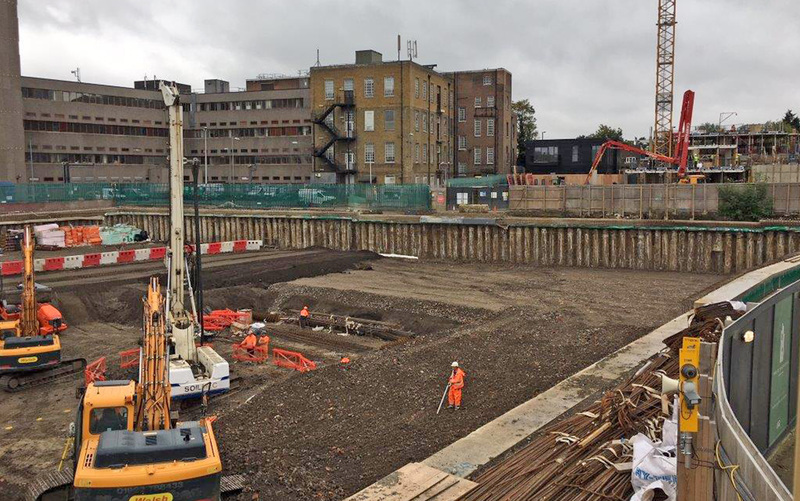 The construction of new student accommodation in East London for main contractor HG Construction required Central Piling to carry out complex foundation analysis to demonstrate the safety for nearby infrastructure prior to starting piling. As part of the redevelopment of Epsom Downs Racecourse a new grandstand is to be constructed. The challenge of this project was to form greater/larger space within a confined space in a listed building to provide banking financial services. 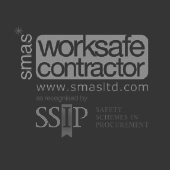 Access for all equipment was restricted to 1.8m width and in some areas 3.5m in height.